Wooden cutting board, diameter 25 cm. Made of sustainably sourced acacia wood. Handmade from the Phillipines. Wooden cutting board, garlic shaped, 16x16 cm. Made of sustainably sourced acacia wood. Handmade from the Phillipines. Wooden cutting board, diameter 23x33 cm. Fish shape. Made of sustainably sourced acacia wood. Handmade from the Phillipines. Wooden cutting board. Size: 14 x 35 cm. Fair trade from the Phillipines by Kinta. Wooden cutting board squared. Size: 25 x 25 x 3 cm. Weight 1 kg. Fair trade from the Phillipines by Kinta. Wooden cutting board in patchwork, 30 x 30 cm. Made of sustainably sourced acacia wood. Handmade from the Phillipines. Wooden cutting board. Rectangle. Size: 28 x 44 x 2,5 cm. Fair trade from the Phillipines by Kinta. Wooden salad server. Bleached wood. Length 28 cm. Fair trade from the Phillpines. Wooden salad server. 35 x 9 cm. Made of acacia wood. Fairtrade by Kinta. Wooden salad set. Length 30 cm. made of sustainbly sourced acacia wood. Fair trade from the Phillipines. Salad set, made of wood. Length 30 cm. White and red. Fair trade by Kanika. Wooden fork. 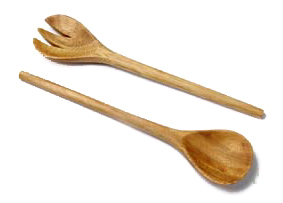 Wooden cutlery of acaiawood. Length: 20 cm. Fair trade form the Phillipines. Wooden knife, made of acacia wood. Length: 20 cm. Fair trade form the Phillipines. Wooden spoon. Length: 14 cm. Made of sustainable acacia wood. Fair trade from the Phillipines by Kinta. 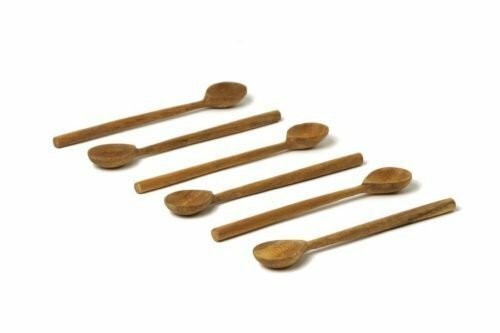 Teaspoons from acacia wood. Set of 6 pieces. Length 15 x 2 cm. fair trade from the Phillipines. Wooden spoon. Olive wood. Length: 15 cm. Fair trade by Kinta.